New York (TADIAS) – We conclude this year’s Women’s History Month series with a Q & A with political leader, human rights activist, and former judge Birtukan Mideksa who joined the Ethiopian Diaspora community in the United States last year. She is currently a Reagan-Fascell Democracy Fellow at the International Forum for Democratic Studies in Washington, D.C., which is supported by The National Endowment for Democracy. The program offers a select group of global leaders with a scholarly environment to reflect on their experiences, conduct research, write, consider best practices and lessons learned, and develop worldwide professional networks. TADIAS: As a fellow at the National Endowment for Democracy you have spoken about pathways to peace in the Horn of Africa. Can you share more about your current work? What do you enjoy most about it? 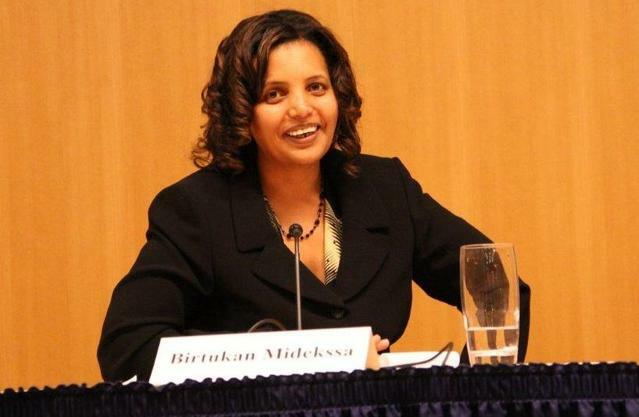 Birtukan Mideksa: As a Regan Fascel Democracy fellow, I am primarily engaged in an academic exploration focusing on the basic challenges of democratization in our country Ethiopia. The program gave me an opportunity to reflect on the issues and analyze the root causes underpinning the core political problems of the country. The National Endowment for Democracy is a venue where political activists from across the globe come together to exchange views and experiences. What is so fascinating in my stay here has been observing the similarity in the challenges that citizens across borders have to overcome to realize their aspirations for free and dignified life. Yet, this comparative examination also helps one to realize that this noble cause eventually triumphs. That in turn is inspiring. Besides, as a fellow based in Washington, DC, I have lots of opportunities to shed light on the plight inflicted on my fellow Ethiopians by an authoritarian and unaccountable regime ruling the country. BM: One might say she was from the world of legend and myth. But, the heartfelt desire of the Queen of Sheba to acquire the wisdom and art of governance is celebrated by both major religions in our country. I am fascinated by her story, a story that is perhaps one of the most ancient ones showing a woman who did not consider her femininity as an inhibition for achieving something great and worthwhile. Of course, there are lots of contemporary women, both Ethiopian and non-Ethiopian whose life is inspiring. I have, however, to single out Aung San Suu Kyi as one whose life has immensely influenced mine. Her courage, her moral integrity and her rigorous adherence and commitment to non-violence are unique in the stage of world politics. This woman who looks weak and frail, who has nothing to do with anger or malice, and who is often low-key and modest has exerted such a huge influence on world leaders, policy makers and more importantly millions of fellow humans including her countrymen and countrywomen. She showed fearlessness without foregoing her humility. She defied the rulers in the Military Junta of Burma without becoming hateful towards them. She is my icon who always affirms to me that it is possible to advance politics guided by moral principles based on respect and love for humanity. TADIAS: What are some ways you have personally chosen to overcome the hurdles that you have faced both as a woman and as a leader in law & politics? BM: What helps me most to survive the hurdles I faced is the depth and intensity of the ideal and vision I have with regard to the worth and dignity of the individual citizen and the way our society should be organized based on this universal ideal of human rights and the rule of law. My belief and conviction that we can and should change the status quo, though it appears to be daunting, has kept me going. And my trust in the power of the individual to bring about change enables me to consider the price I paid as a sacrifice made for a worthy causes and purpose. TADIAS: What are some practical tips you can give for young women who want to follow in your footsteps? BM: I would like to remind young women that public service or political engagement is not a domain exclusively reserved for men. In fact, I don’t think we can truly succeed in transforming the political system into a system which incorporates equality and fairness at its epicenter, unless Ethiopian young women are determined to contribute something significant to the process. So I would like to encourage our young women to dream a future for our nation with a dignified and flourishing life for all citizens. And it’s important to believe in the ability of everyone of us to champion change. It is obvious the public discourse and the political process of our country is complex and traversing through it is an uphill journey. But if we stay committed and if we focus on the things we can offer and the societal issues we can be engaged in, all of us can play a role to lead our country towards freedom and democracy eventually. BM: I was born and brought up in the Ferensay Legacion neighborhood of Addis Ababa. I went to a public mid school called Miazia 23 and Yekatit 12 (Menen) for my elementary and high school education respectively. And I graduated from Addis Ababa University with a degree in law. I believe my passion for politics has a strong correlation with the fact that I was brought up in a community whose members are strongly committed to maintaining healthy social relations and to looking after the well-being of individual members. My training as a lawyer later on gave me some coherent narrative and vision for this aspiration of mine. TADIAS: What would like to share on Women’s History Month with Tadias readers that we have not asked you about? BM: I think we need to celebrate our unsung Ethiopian heroines who really made it in every realm of life. From the queens and wives and mothers of kings who take part in leadership to promote peace and security, to women advocates of change in Ethiopian popular revolution who paid dearly as equal with their male partners deserve our respect and commemoration for what they did and attempted to achieve in securing better societal destiny for our nation. Most importantly, we should cherish and recognize the Ethiopian mothers and wives who bear tremendous burden and tirelessly struggle amidst challenges of impoverishment to feed their family, and to send their kids to school to get an education that perhaps they never had an opportunity to access themselves. TADIAS: Thank you and happy Women’s History Month from all of us at Tadias. Click here to watch Birtukan Mideksa’s tribute to Vaclav Havel. Birtukan has paid her due! She is an Ethiopian Hero! I am happy to see that Birtukan Mideskka has immersed herself in studying and researching. I am delighted to see that she has recognized that Aung San Su Ki is her spiritual friend in arms. Peace as a goal is an ideal which will not be contested by any government or nation, not even the most belligerent. I wish both ladies well to make history!! time will solve it all, negern hulu begizew wub argo yeserawal… thank you Birtukan for you’re doing in your life for our ppl. Wish you long life! They may not be as prominent and as famous to the outside world as Ms. Midekssa but there are several contemporary women leaders in Ethiopian parliament. great article! i definitely saw her in a different light. I can imagine Birutkan Midekssa as Ethiopia’s head of state. That would be a spectacular come back for Ethiopia on global stage! I loved her speech. Her word choice and calm demeanor reminds me of Haile Selassie. Good job Birtukan! Wow, I didn’t know that the she was from Ferensay Legacion neighborhood. Girum new yesefer lij!! I liked the interview. A remarkable women. This is one of the most intimate and relaxed interview with Birtukan Midekssa I have seen. I am impressed by confidence and language of forgiveness and peace. so many interesting things I did not know about her. Great to see her from this perspective! Her quote about the wisodm of the Queen of Sheba has touch me to the core. She is the advocate I have been waiting for. I have written it it by hand and posted on my dorm-room wall! “The heartfelt desire of the Queen of Sheba to acquire the wisdom and art of governance is celebrated by both major religions in our country. I am fascinated by her story, a story that is perhaps one of the most ancient ones showing a woman who did not consider her femininity as an inhibition for achieving something great and worthwhile.” – Birtukan Midekssa! I agree fully that it would indeed be a spectacular comeback for Ethiopia!!! Who else do we have? she is the only bright light at the end of the tunnel for the country. And if you really think about it, she may in fact be the only/best AND face-saving way out for meles too. A wise person once said that courage is not limited to the battlefield… The real tests of courage are much quieter. They are the inner tests, like remaining faithful when nobody’s looking, like enduring pain when the room is empty, like standing alone when you’re misunderstood. Birtuksn has been there, she has done that! My Respect and my best wishes on her future endeavors. Thank you for what you are doing for your country! The encouraging thing is that every time you meet a situation, though you may think at the time it is an impossibility and you go through the tortures of the damned, once you have met it and lived through it you find that forever after you are freer than you ever were before. If you can live through that you can live through anything. You gain strength, courage, and confidence by every experience in which you stop to look fear in the face. You are able to say to yourself, `I lived through this horror. I can take the next thing that comes along.’ The danger lies in refusing to face the fear, in not daring to come to grips with it. If you fail anywhere along the line, it will take away your confidence. You must make yourself succeed every time. You must do the thing you think you cannot do. Poverty, lack of Education and democracy are the main problems. @Ethiopia Hagrere: MY SENTIMENTS EXACTLY! This a timely and long over due conversation. Thank you! Nothing can be more abhorrent to democracy than to imprison a person or keep him or her in prison because he or she has a diffrent point of worldview. This is really the test of civilization. In a democracy the people will have more power than the few, because there are more of them, and the will of the majority is supreme.